Short Sale Calculation for Excel provides a proven systematic way to evaluate distressed properties. It instantly discovers foreclosure and short sale profits. Short Sale Calculation for Excel calculates offer prices and instantly shows profits based on one or several offer scenarios. 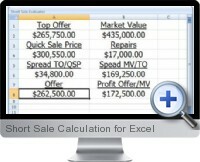 Short Sale Calculation for Excel makes instant calculations on the fly using an automated procedure. PC and Smart/PDA phone compatibility makes this software field usable. Make your calculations in real-time while inspecting your next real estate purchase.